Online Guide to Mediation: Does ADR deliver justice? Several months ago someone tried to post one of those unwelcome comments that all bloggers receive from time to time. With plenty of full capitalization for emphasis, and with attacks on my character and personal habits thrown in for good measure, the writer accused me, among other things, of undermining the rule of law simply because I happen to be a mediator. Since I allow attacks on ideas only not on people on this blog, I hit "delete". I have remained haunted however by the concern this person raised. Were they right--does ADR weaken the rule of law? I have written critically before of ADR's two-edged nature and encouraged my fellow ADR practitioners to consider with care their responsibility to the public and to our institutions of justice. Of course we as a profession should ask ourselves these kind of questions. Does ADR undermine the rule of law? If justice is the end, is ADR the best means? 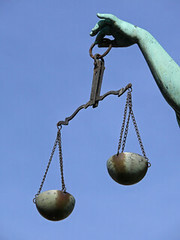 Are we as mediators in the business of delivering justice or simply final resolution? Do the attorneys and/or clients who use our services want us to be in the business of delivering justice (or enabling it?) when we help them resolve a dispute? One day remains to complete the survey. On a related note, seekers of justice may wish to read "Is Alternative Dispute Resolution Consistent with the Rule of Law?" by Jean Sternlight, Michael and Sonja Saltman Professor of Law and Director of the Saltman Center for Conflict Resolution, University of Nevada, Las Vegas. What is the relationship between alternative dispute resolution (ADR) and the rule of law? In the United States, critics often argue that the informal, private nature of ADR is hostile to the rule of law--and ultimately to justice itself. Yet over the last ten years, a broad, international array of groups has advocated including ADR in projects designed to foster the rule of law in other countries. This Article explores the paradox. Have we erred in condemning ADR domestically or in promoting it internationally? Or does the desirability of ADR depend upon the nature of the system in which it is being utilized? By studying this paradox, we can enrich our understanding of the ultimate purposes of both ADR and the rule of law, and thus assist our search for justice. This article is accessible for the time being, I regret to say, only to those with access to Westlaw. While an increasing number of articles by legal scholars are available for free on the internet, some still remain beyond reach, hidden behind password-protected gateways--in my view unfortunate. An abstract of the article is available at the Social Science Research Network. May 1 is Law Day: how will you celebrate it?